This month holds a special anniversary. 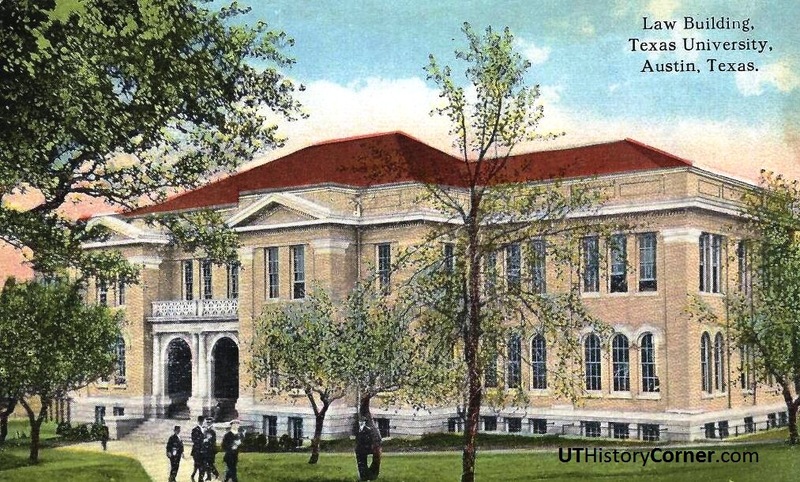 While UT fans are well-acquainted with Bevo as the mascot for the University of Texas Longhorns, the first UT mascot was a beloved tan and white dog named “Pig,” who would be celebrating his 100th birthday. 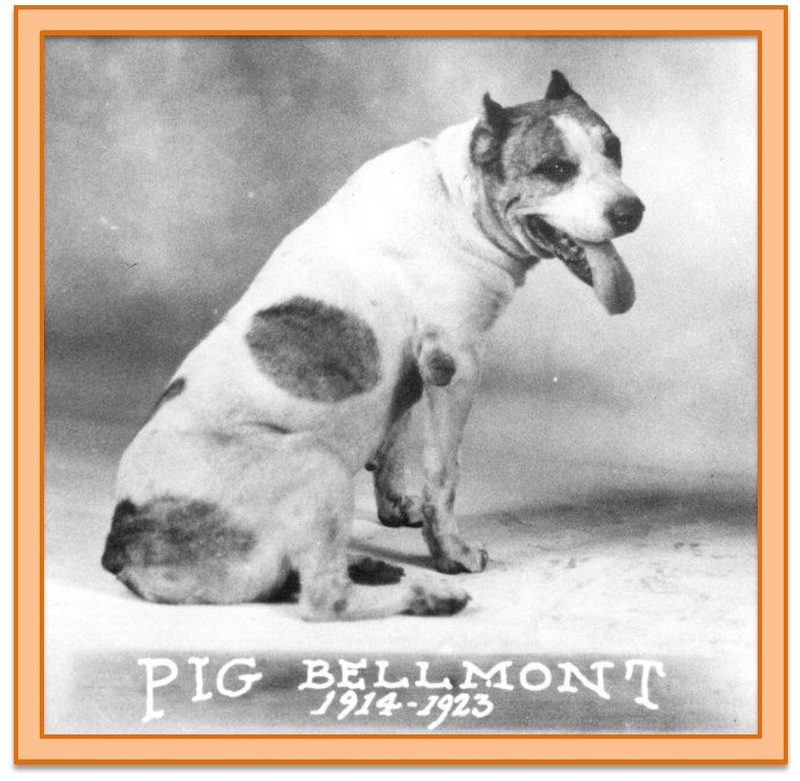 Born in Houston on February 10, 1914, Pig was a seven-week old puppy when he was sent to Austin to live with his new owners: Theo Bellmont and his family. A native of Rochester, New York, Bellmont (photo at left) attended the University of Tennessee, played football and basketball, ran track, was an accomplished gymnast, and in 1908 graduated with a law degree. 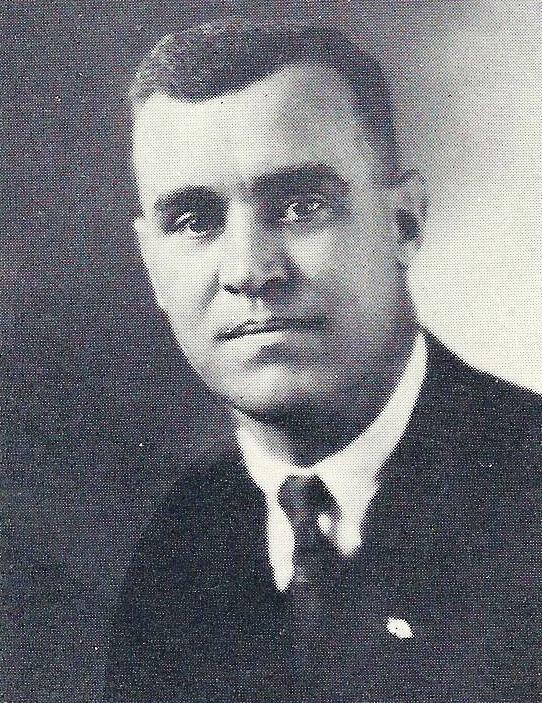 His interest in physical training and education soon led him to the position of Director of the Houston YMCA, where he worked to expand the programs and influence of the “Y.” Bellmont’s efforts were noticed by UT President Sidney Mezes, who was looking for someone to oversee what was a quickly-growing University athletics program, and in December 1913, Mezes hired Bellmont as the first full-time athletic director for the University of Texas. Bellmont, his wife, Freda, and their two children made the move to Austin soon after the new year. The family had acquired a new pet dog, but the puppy remained in Houston until he was weened. As soon as the dog arrived in Austin, it was evident that he was a special character. An adventurous pooch, he refused to remain confined to the family’s backyard northwest of campus, and instead followed his owner to work on the Forty Acres. The UT campus was an exciting place, full of attentive students, squirrels to chase, fields of bluebonnets, and plenty of trees. At the encouragement of Theo Bellmont, the dog attended a few sports contests and found the games loud, fun, and very much to his liking. 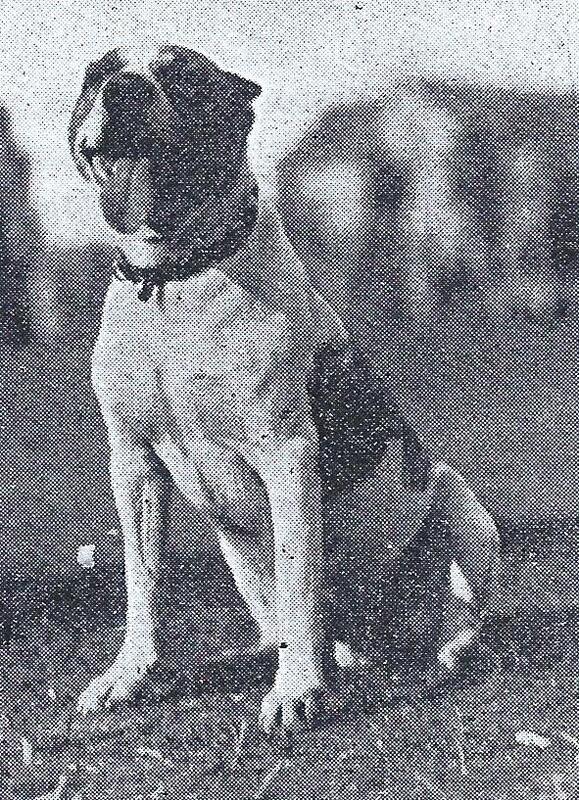 Almost immediately, the puppy was adopted by the campus community, and while UT athletic teams were already known as “Longhorns,” the dog was officially declared to be the University mascot. 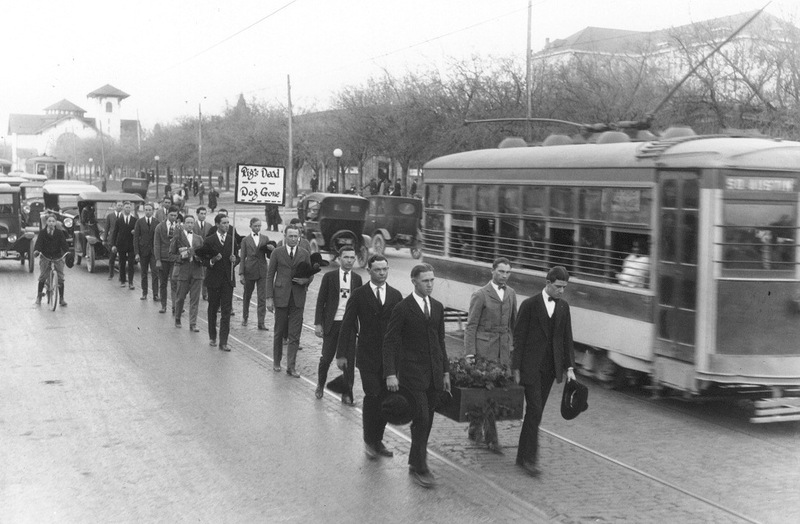 Above: the 1914 UT football team. 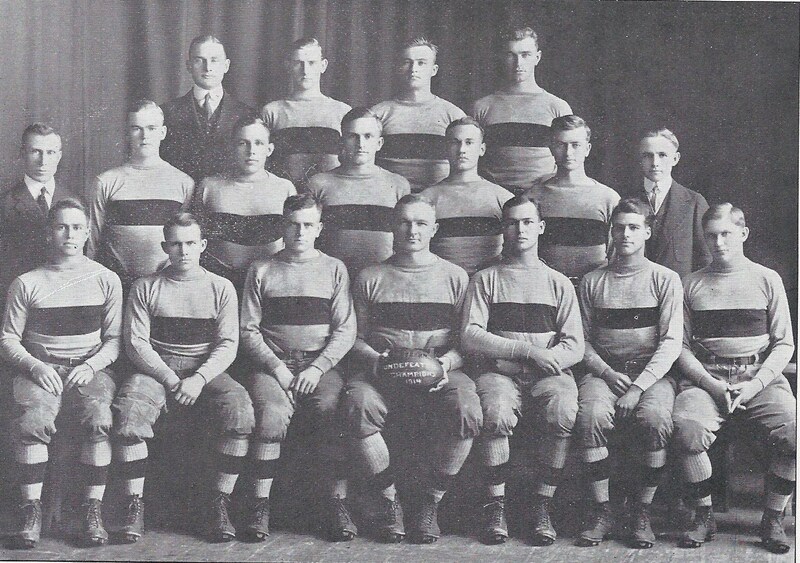 Gus “Pig” Dittmar is pictured on the second row, third from the right. Click on image for a larger view. But Dittmar also just happened to be bowlegged. “Dittmar was rather noted for the graceful way in which his underpinnings curved,” reported the UT student Longhorn Magazine. With the puppy and Dittmar standing together, students noticed that the dog’s legs evoked the same characteristics as the football player. Seized by a happy inspiration, “Let’s call him Pig!” was the decision of the day, and the new University mascot was dubbed Pig Bellmont. For the next three years, Pig greeted students and faculty on daily rounds. He frequented classrooms, though sometimes he had to be removed because of his delight in joining the class discussions. Occasionally, he climbed the marble stairs up to the reading room of the University Library (today the Architecture and Planning Library in Battle Hall) in search of a scratch behind the ears or a lap in which to snuggle. When he was hungry, Pig sometimes visited the University Cafeteria, though he preferred the cuisine of the boarding houses west of campus. At night, Pig retired under the back steps of the University Co-op. Of course, Pig was a regular at home and most out-of-town athletic events. He paced the sidelines for football and baseball games, and ventured indoors to the gym for basketball season. Pig eagerly lent his voice to the support of UT squads and developed a profound dislike for anything related to rival Texas A&M. “If you say ‘A&M’ to him, he will promptly lie down as though ready to give up the ghost in disgust,” related one account. “On the other hand, say ‘Texas’ to him and he starts barking with joy.” Pig was so loyal, some of the University’s athletes suggested that he deserved a letter, which was granted by the athletic department. (As the athletic director was also his owner probably helped in this regard.) Naturally, Pig wasn’t able to don a standard UT letter jacket. Instead, a small brass “T” was fashioned at the University’s mechanical shop and attached to Pig’s collar. He was inducted as the only canine member of the newly established “T” Association. In 1917, when the United States entered the First World War, Pig enlisted. 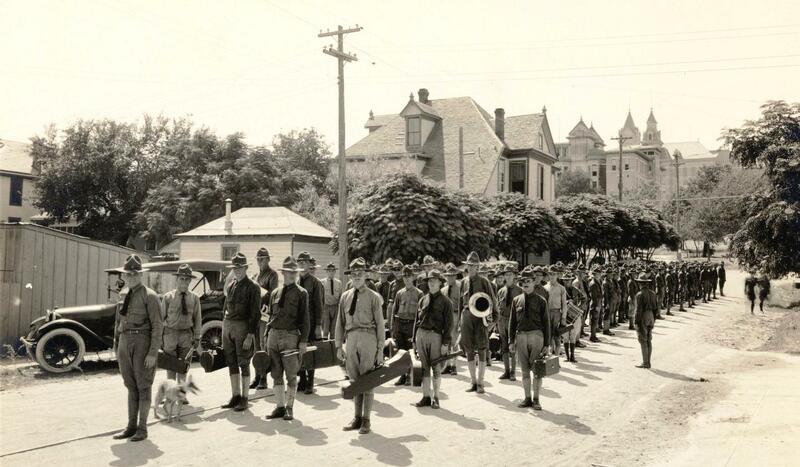 The war transformed the campus overnight, as the University sponsored three military schools on its grounds. The largest was School of Military Aeronautics. A precursor of the Air Force Academy, the SMA was created to provide basic technical instruction for beginning pilots before they moved on to flight training. 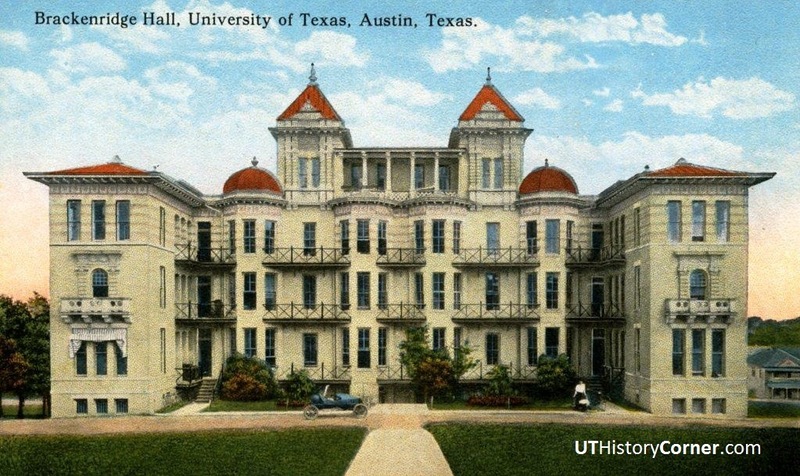 Housed in the buildings on the “Little Campus,” just north of the present day Erwin Center (only John Hargis Hall and the Nowotny Building remain), several hundred soldiers at a time arrived for six-week sessions. Pig joined them. If a long hike was part of the day’s activities, Pig was usually near the front. He kept an eye on the barracks while the cadets were in class, and faithfully attended inspection each evening. The cadets adopted Pig as their mascot, included him in their graduation photos, and he twice took the train ride to Dallas, where the cadets were sent for initial flight training. When he had time, Pig wandered back to the main campus to check in on UT students, most of whom were part of the Student Army Training Corps. Above: Ready for drill. 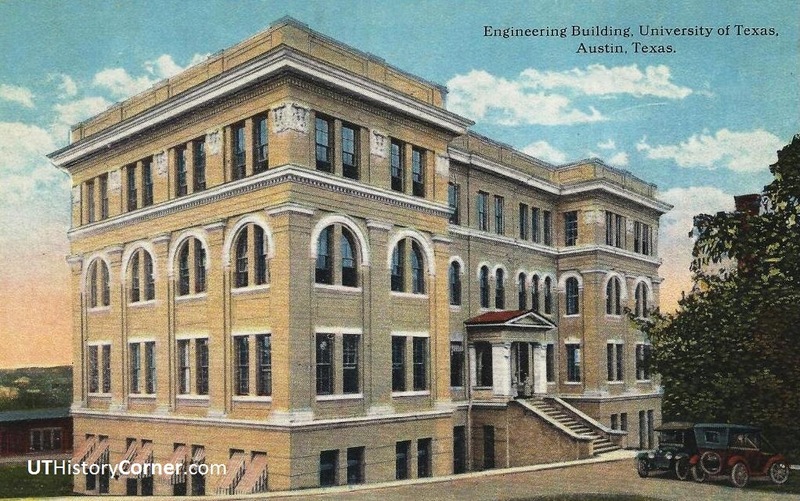 UT students enlisted in the Student Army Training Corps during World War I, and were housed in a line of wooden barracks along Speedway, where Waggener Hall and the McCombs School of Business are today. Up on the hill to the right, Pig inspects the troops. Click on image for a larger view. Below: A blurry Pig waits with the band that will lead the School of Military Aeronautics back to their quarters at the Little Campus. The towers of the old Main Building and part of B. Hall on the campus can be seen in the background. 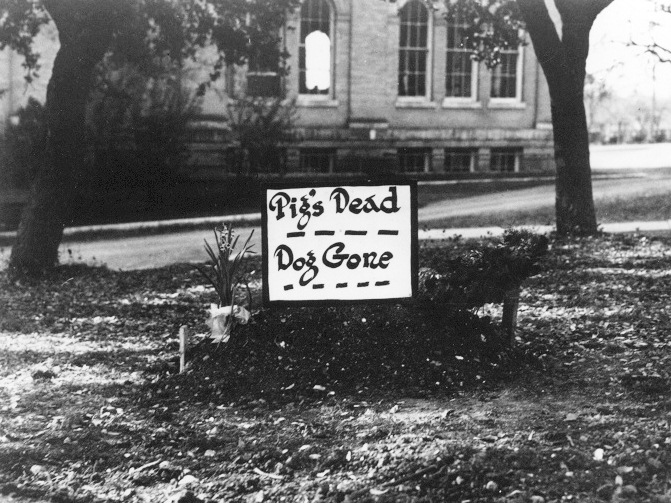 When the war ended in 1918, Pig resumed his duties at the UT mascot, though he made several trips back to the Little Campus, just to be sure the soldiers hadn’t returned. He expanded on his previous routine to include visits to the women’s study hall, where he was always welcome. But Pig was also getting older. By the 1920s, he was noticeably more mellow than in his younger days, and he was going blind in one eye, a condition that would have significant consequences. Early on a Tuesday morning, New Years Day 1923, Pig was hit by a car – a Model T Ford – near the corner of Guadalupe and 24th Streets, and his blindness may well have been a factor. He was apparently only injured, and made several of his usual appearances before he decided to retreat under the back steps of the University Co-op, but the injuries were to be fatal in the long term. Pig’s body was discovered mid-afternoon on Friday, January 4th. The news was a tragedy for the entire campus and the decision was made to provide a proper farewell to the loyal canine. Above: Headline from the January 5, 1923 Austin Statesman. On a cloudy, dreary Saturday afternoon, January 5th, starting at about 3:30 p.m., Pig Bellmont lay in state in front of the University Co-op. He rested in a specially-crafted black casket, complete with a viewing window, that was draped with evergreen garland and orange and white ribbon. More than a thousand mourners filed pass to pay their last respects. 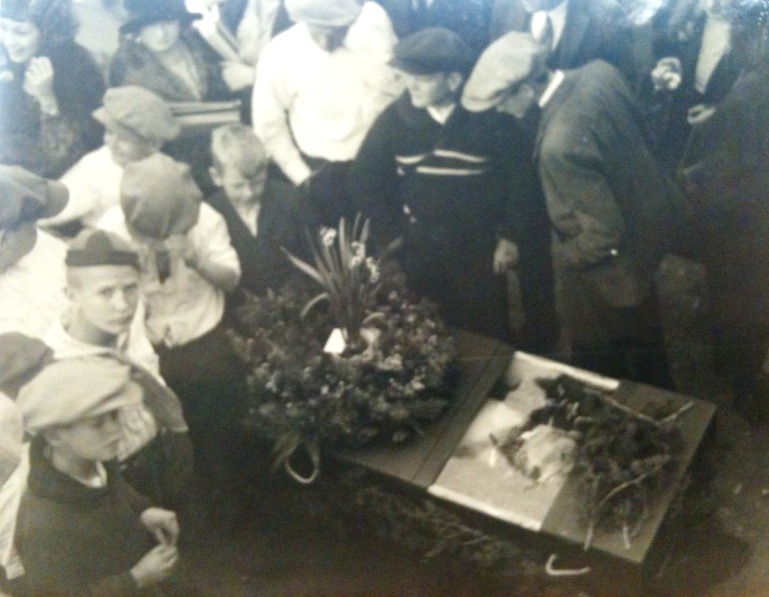 Above: Mourners of all ages visited the casket containing Pig Bellmont. At 5 o’clock, members of the Longhon Band arrived and a funeral procession organized. 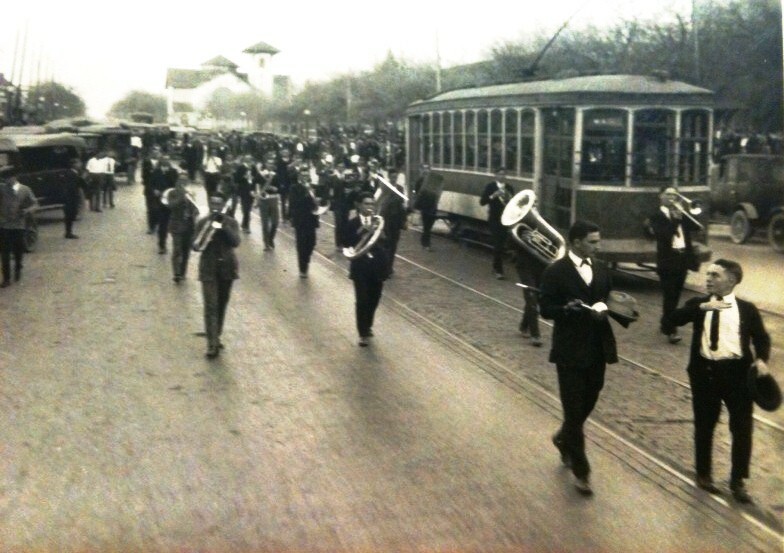 The band led a march from the Co-op, south on Guadalupe to 21st Street, then east to the old Law Building, where the Graduate School of Business now stands. Pig’s pallbearers were members of a new student group called the Texas Cowboys. Above: Head cheerleader Arno “Shorty” Nowotny confers with the drum major of the Longhorn Band as the funeral procession begins on Guadalupe Street. Nowotny later served as Dean of Students and the Nowotny Building is named for him. The University Methodist Church is seen in the background. Above: Immediately behind the Longhorn Band, members of a new student group called the Texas Cowboys carry the casket of Pig Bellmont. 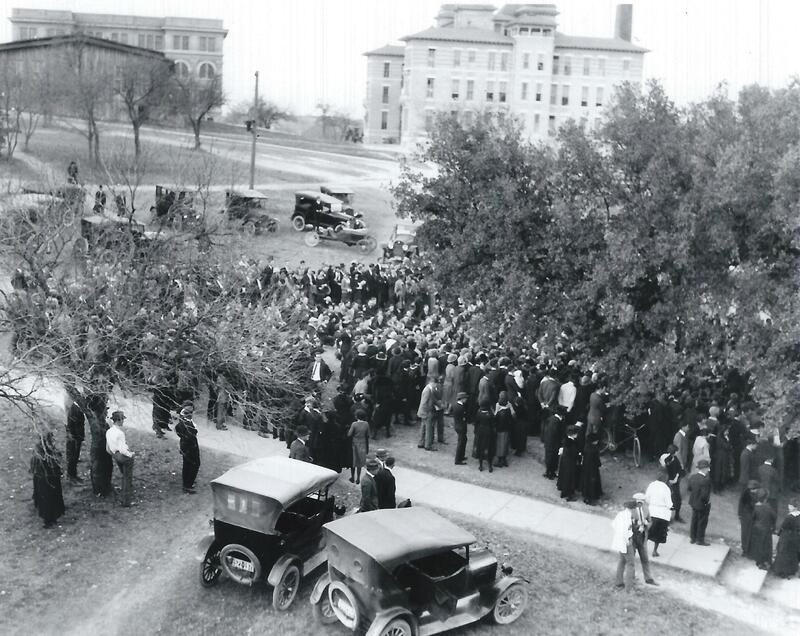 The procession ended under a grove of three live oak trees, just north of the old Law School building, on the southeastern corner of the campus. Rows of folding chairs were provided, but quickly filled, and it was standing-room only for the service. Above: Along the walkway that connected the old Main Building to the Law School, the funeral procession ends under a grove of three live oak trees. In the background to the right is B. Hall, the first men’s dorm. To the left behind the shack is the original Engineering Building, which survives today as the Gebauer Building. Click on image for a larger view. With some onlookers perched in the trees, Thomas Taylor, the Dean of Engineering, delivered a 20-minute eulogy for Pig Bellmont. Click on image for a larger view. 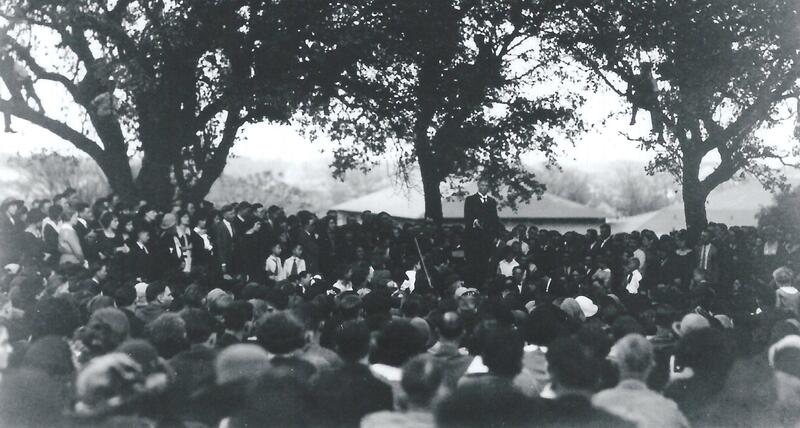 Following Taylor’s remarks, the Longhorn Band played “Taps” as Pig’s casket was lowered into a prepared grave. 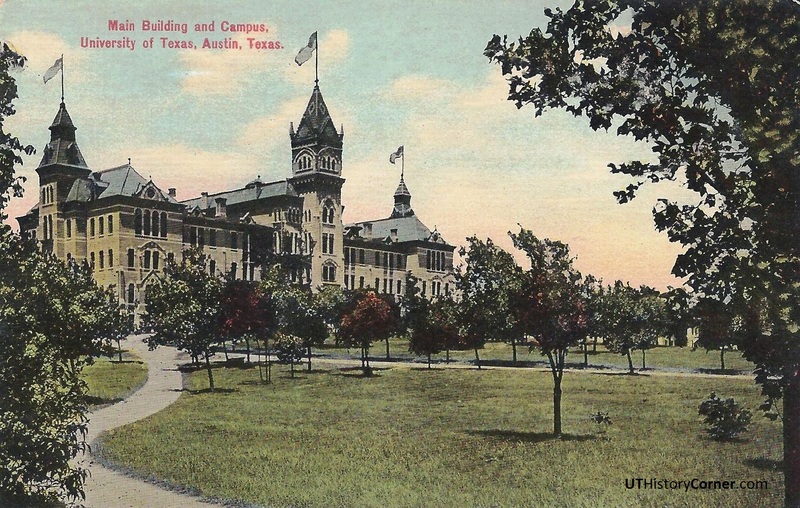 “Then, as the last low strains of the call died away,” observed The Texan, “and as the listeners were standing breathless, there wafted on the air the notes of the same call, from another point on the campus.” On cue, a lone trumpeter played “Taps” in front of the old Main Building. This entry was posted in Uncategorized and tagged Bellmont, Dittmar, Gus, Jim Nicar, Pig, Theo by jimnicar. Bookmark the permalink. Wonderful tribute! Is Pig’s grave site still marked today? Around 2005 or so, all three buildings on the east side of the South Mall – Batts, Mezes, and Benedict Halls – went through an extensive renovation. Amidst all the construction, the sign was either damaged, lost, or both. Another effort to place a new marker was made around 2008, but at the time was postponed, as the Landmarks program to bring public art to the campus was just getting underway. That’s where things currently stand. One day, I hope, we’ll be able to get a marker out there again.